Gradually, together with my husband Ivan Ginev I realized that the time was ripe for the decision to start doing what we were best at – making Bulgarian essential oils and flower waters. We created ARMINA. With it, we invested all our knowledge, expertise and experience in a business which was to contribute to preserving Bulgarian herbs and plants without harming nature and people. We began by exporting essential oils and floral waters in bulk to wholesalers and to manufacturers of cosmetics. Than we created our own brand Armina – organic, authentic, with cause. Our company is from the land of roses and our most precious gem is our rose oil, 100% genuine without synthetic substitutes, made from the Bulgarian Rosa Damascena we grow ourselves. All our products are organic certified; most are from Bulgaria. 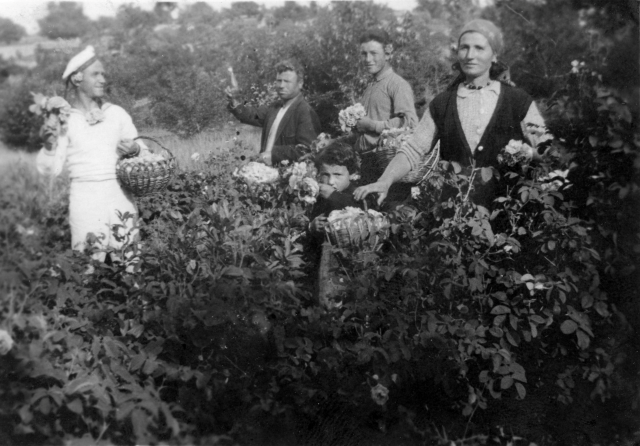 Ivan’s family expertise in rose cultivation dates back three generations. Here in this picture from 1938 from left to right: his uncle (a sailor); his grandfather (a farmer); his father (a musician); his aunt; his grandmother (a housewife). And we love what we do. Retrieving long lost traditional knowledge while applying evidence-based science opens new horizons allowing us to develop sustainable farming practices and sustainable production methods. Working together with farmers we are helping them secure their livelihoods. Making high quality organic products we continue educating consumers while offering them genuine, sustainable products. And deep in our hearts, we have remained scientists. The curiosity, which was such a vital part of our work as scientists engaged in fundamental research, is still driving us towards exploring unchartered lands. Our new adventure is already in the pipe. Stay tuned for news updates.